Remove moderate to light imperfections quickly and easily! The Rupes Green Medium Foam Pads are designed for removing moderate to light swirl marks, water spots, and oxidation with ease! All of Rupes pads are made with super durable open-cell foam that is designed to withstand the excessive wear of the Big Foot Polishers, allowing you to achieve great polishing results every time! 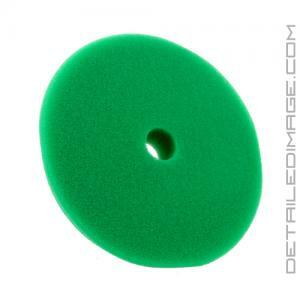 This green polishing pad features densely packed foam that allows you to remove moderate swirl marks and other imperfections. Simply pair it with your favorite corrective polish (i.e. Rupes Quarz Gloss Medium Gel Compound) and you will be amazed at how quickly and easily you can remove light to moderate imperfections in your paint! This pad will finish down extremely well, however we do still recommend that you follow it up with a lighter cutting pad and polish combo to maximize gloss and depth. If you are looking for a durable foam pad to help you remove moderate imperfections, pick up the Rupes Green Medium Foam Pad today! Rupes 30 mm (1.25 inch) Foam Pads are designed to be used with a 1.25 inch hook and loop backing plate (i.e. Rupes iBrid Nano Backing Plate). 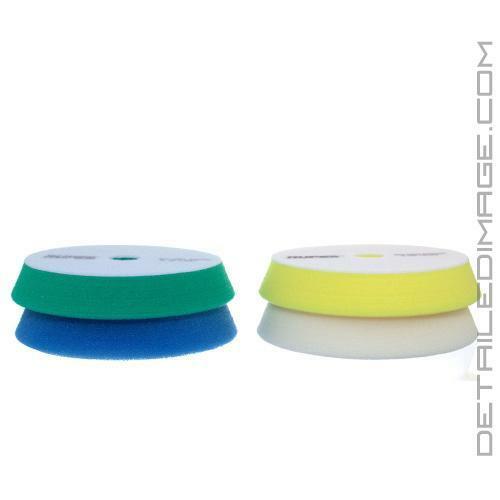 Rupes 50 mm (2 inch) Foam Pads are designed to be used with a 2 inch hook and loop backing plate (i.e. Rupes iBrid Nano Backing Plate). Rupes 100 mm (4 inch) Foam Pads are designed to be used with a 3 inch hook and loop backing plate (i.e. Rupes 3" Backing Plate). Rupes 150 mm (6 inch) Foam Pads are designed to be used with a 5 inch hook and loop backing plate (i.e. Rupes 5" Backing Plate). Rupes 180 mm (7 inch) Foam Pads are designed to be used with a 6 inch hook and loop backing plate (i.e. Rupes 6" Backing Plate). 1.25" - Backing measures 1.25"", while the front measures 1.5"
2" - Backing measures 2", while the front measures 2.5"
4" - Backing measures 3", while the front measures 3 7/8"
6" - Backing measures 5", while the front measures 5 7/8"
7" - Backing measures 6", while the front measures 6 7/8"
1.25" - Backing measures 30mm - 1.25", while the front measures 38mm - 1.5"
2" - Backing measures 50mm - 2", while the front measures 60mm - 2.5"
4" - Backing measures 80mm - 3", while the front measures 100mm - 4"
6" - Backing measures 130mm - 5", while the front measures 150mm - 6"
7" - Backing measures 150mm - 6", while the front measures 180mm - 7"
This is my go to pad, make sure when using this pad to allow the pad to do the work. If you apply too much pressure the pad begins to fall apart inside and out. Works great with any low grit and high longevity polish/compound. Will be buying more of these, if anything all kinds and colors Rupes offers. Dont second guess Rupes bite the bullet and pay the extra money the pads and paint your correcting are worth it! The pad produced especially nice results. I used it with Optimum Hyper Polish. The only drawback, the pad was rather short-lived, (beginning to come apart after polishing 3 cars). Wow, this thing fell apart after 3 uses. We never even made it around 3 full cars (all Porsche 911's, so not a ton of surface area) before they basically fell apart, threw a ton of green bits of foam everywhere and almost separated in two. Everyone has always said the Lake Country pads are low end pads, but they have never done this to me. I wanted these because of the 7", but even that was an issue, once you were up at speed the pad would take on a concave shape so only maybe 80-90% of the pad was touching, and the edges were floating above the surface. Rupes polisher = awesome, Rupes foam pads = not even remotely awesome. I'm going to try Meguiar's foam pads or stick with the old standard Lake's.